If you’re searching for ways to save money and time in the kitchen but still create nutritious meals each day, starting with a menu plan for weekly meals can help immensely. 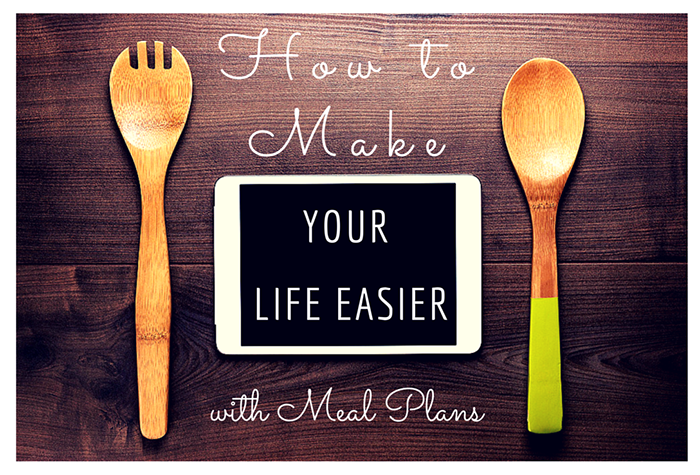 Why are meal plans awesome for busy families and hectic schedules? 1. A menu plan begets a focused grocery shopping list. How many times have you gone to the store and gotten home without one or two important items? Keep a pad and pen near by and write down items for each planned meal, or keep track of what you need in your smartphone with the notebook function or with a grocery app like Grocery iQ (available for iOS and Android). 2. A menu plan allows you to save time in the kitchen. Knowing that you have everything you need because you’ve kept track of it means no last minute runs to the store or awkward substitutions. 3. You can make a menu plan for one week, two weeks, or if you’re feeling really organized you can plan out months in advance. Keep each week’s menu plan in a journal, file, or in your phone or computer. Make notes about which ones your family likes and dislikes and modifications that might make the meal better. Be creative and don’t be afraid to experiment with recipes! 4. You can also make “snack plans.” Come up with a healthy after-school snack for each school day of the week. 1. 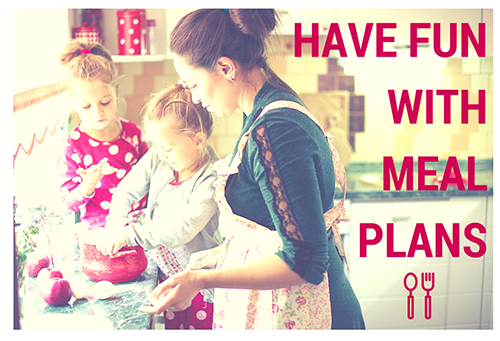 Make a list of all the dishes your family enjoys. 2. Mark dishes that take considerably longer than 30 minutes to prepare, not counting cooking time, so you can save those for days you have more time. 3. Put each main dish into categories such as Mexican, Italian, sandwiches, soups, salads, casseroles, lunch-for-dinner, breakfast-for-dinner, etc. 4. Leftovers are your best friend. Many meals still taste great when reheated, and eating leftovers saves time and money. 5. Make the quickest and easiest meals on the busiest nights. 6. Create routine with your weekly meal schedule, e.g. Taco Tuesdays, Italian on Mondays, make-your-own sandwiches on Fridays. Instilling tradition, even in the smallest of ways, in your kids’ lives will help your family stay connected. 7. After you’ve chosen your meal categories, it’s time to look through your cupboards to see which ingredients you already have and which ingredients you need to purchase. Take your time with this – organize your pantry, throw out old food, and make lists of what you already have. 8. Be flexible. Plans change, people stop by, meetings pop up, and sometimes you just feel like being waited on at a restaurant. By having a meal plan, you can choose to switch meals from one day to another and still know you have everything you need. 9. Before you know it, you’ll practically have your own personalized family cookbook with solid go-to recipes.